Windows Phone 7 will be getting its much-needed “Mango” update this fall and it looks to add features on all fronts. In April, we detailed some new developer features Microsoft will be adding, and yesterday Redmond announced some new productivity features that will be added to the smartphone operating system. We’ve got the full list below. Facebook Chat: The Windows Dev Podcast announced this feature (and some others) this week. Along with Windows Live Messenger, Facebook Chat will be built right into Windows Phone. Not too shabby. Music Hearting: Finally, the Zune Like/Dislike rating system of Hearting and Broken Hearting songs will come to Windows Phone as will smart dj mixes. Auto Sync & Xbox Live: We’re not quite sure of the implications of either of these, but a screenshot on the Dev Podcast shows a Settings screen with an on/off toggle for “Connect to Xbox Live” and “Automatic Sync” for games. We’re assuming that games on the Phone will now be able to communicate instantly with games on your console, allowing you to resume a game or complete a special task on the go. Threaded email conversations: Much like Gmail, Windows Phones will now appropriately group email conversations together, making it easier to sort through your correspondence. Pinnable email folders: Just as Microsoft is making it possible to pin any page of an app to the homescreen grid, now you can pin folders of email as well. Office 365 & SkyDrive support: In Mango, you will be able to save and share Office documents through Microsoft’s Office 365 and Windows Live SkyDrive, allowing you to keep and access documents from the cloud. Email server search: This is a sorely missing feature from the current build of Windows Phone. Soon, you’ll be able to search through all of your emails, not just the 10 or 15 stored on the phone. 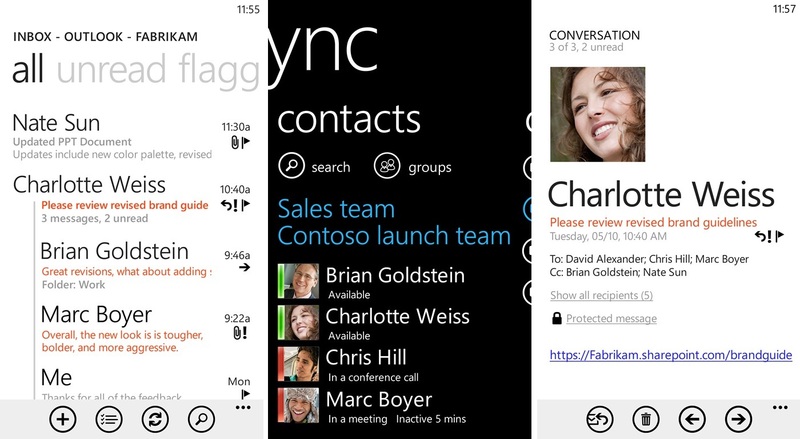 Lync: Lync Mobile will be available on WP7, allowing you access to the service. IT stuff: complex password support, support for hidden corporate Wi-Fi networks. Hopefully we’ll know more soon. We should be able to share a lot more about Mango in the next two weeks as Microsoft continues to take the wraps off the latest build.